In this book, Doon and Lina go back underground looking for they don't know what. The adventure that they have is gripping, making it hard to stop reading (or listening) which is to me critical for a good book. In the end, things are wrapped up nicely, questions answered, and a feeling of comfort about the future of the characters is given that was missing from the first books, since they weren't intended to be the end of the series. 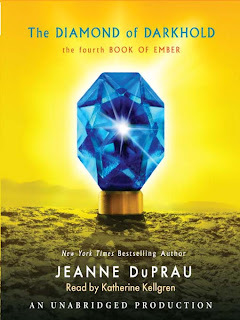 I do hope, though, that Jeanne DuPrau is not done writing about this world she's created, because I like how things ended up and thing that there's a potential for some really cool futuristic stuff. I'd also like to see a novel that depicts the events of the great disaster, around the time that the people of Ember go under ground in the first place, since that's what I was expecting from the Prophet of Yonwood, but didn't get. The reader, Katherine Kellgren, does a fine job. No complaints there. I'd give it a 6 or 7 out of ten then considering story and narrator.